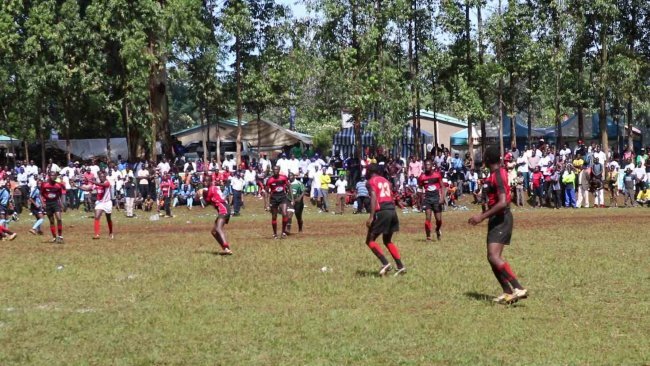 Bungoma High school won their maiden rugby 15-aside as the Kenya Secondary schools sports Association (KSSSA) games ended on Saturday at the Friends High School, Kamusinga. The champions outsmarted debutants Moi High School Sirgoi in the one sided final match for Bungoma to lift their first national trophy ahead of East Africa Secondary school games in Eldoret later in August. Boniface Akwana gave Sirgoi the lead in the 5th minute through a drop ball but it was fast answered Bungoma’s Erick Otieno through a penalty that equaled the score 3-3. Otieno missed a penalty by hitting the post and also his drop ball hit the post too before converting a penalty for a 6-3 lead for Bungoma into break. After the break Otieno converted another penalty but he surprised Sirgoi with the first try of the game. Akwana who is known for his long range shots, converted a penalty on the 4oth minute. He missed his own conversion before he won another try through the right corner of the pitch just before Otieno grabbed the ball to go past the white wash for his second try just as the bell rung to signal end of play. Otieno kicked the ball out of play as Bungoma won 19-6. Anthony Otindo, the Bungoma High captain said they had studied Sirgoi’s defense and game play. “We used strong side against them and many mauls that we created were of great help to us.They are strong on counter attack and we had to cut their speed as we presented a tsunami against their forward and backline,” said Otindo adding that the historic win would boost them as they head for east Africa games. The two finalists were first runner up in group A and B respectively as Sirgoi beat Upper Hill 13-12 while Bungoma beat their neighbors Kakamega 7-5 in semi finals on Friday. Former East Africa champions Kakamega won the third position after beating Upper Hill 19-11. Wiseman Aganya scored a try before Aggrey Oguna recorded two tries as Marvin Mwaura converted both tries for Kakamega while Jonstone Olindi converted a penalty and Bruce Ambita made one try for Upper Hill. Two national records were broken in the girls 50m Butterfly and boys 100m backstroke. Gichovi Hadassah lowered Joy Wanjala’s two-year record from 33:67 to 32:62 while Eddy Kyle shattered Emmanuel Ndonga’s record of 1:11.54 to 1:10.57. East Africa Hockey champions Sinyolo girls defended their national title by a solitary goal from Janet Awuor in the 58th against Tigoi. Sinyolo bundled St. Cecilia Misikhu 3-0 enroute to finals while Tigoi edged Kerugoya 2-0. “We managed to play skilful match that is why we won. Our target is to defend the East Africa title in august,” she said amid cheers from her fellow players. “When we left the school, we were confident that they will win the national trophy and we have done that,” said Anyango. Kerugoya finished third after beating Misikhu 3-0 in the play offs. Hosts Kamusinga High school won their 13th national when they beat Upper Hill in boys’ hockey final. The champions beat Upper Hill 2-1 in the final match with Derrick Juma and Collins Mukarani for the hosrs. Kamusinga beat St.
Anthony’s Kitale 3-1 in a Nzoia derby while Upper Hill outsmart defending champions 2-0 in the semi finals. In play offs, Kitale beat defending champions Narok Boys 5-2 in flits after a normal time 2-2 draw. Former national champions Upper Hill easily won the final against Alliance High school in boys basketball 81-24. Upper Hill won in all quarters 24-05, 27-09, 08-04 and 30-06. The champions had beat newcomers Aga Khan 70-30 in the first semi final match while Alliance had edged out Nzoia representatives Kapenguria boys 40-38. Upper Hill Captain Riny Riny said that what they wanted was to play an easy winning game since they had had a solid training programme. “The game was so easy and it was not that hard as we had expected to be. Last year we lost the national title to Maseno but this year, we have redeemed ourselves and the win is a clear indication of our spirited fight,” said Riny who wants to win the East Africa Games after finishing second in the games. Kapenguria got a chance to play at East Africa games when they finished third after beating Aga Khan 62-40. Debutants Kayatiwi shocked favourires Buruburu in girls’ basketball final. The Coast representatives beat metropolitans 53-25 in 14-12, 14-13, 05-05 and 08-07. The two rivals were placed in pool A and final win was a litmus test for the two teams as Buruburu bowed out. Newcomers Barchondo girls won the third place after beating Loreto Limuru 57-42.